"It's a heartfelt pleasure to recommend this book. It's packed with useful information on texts, assignments, demonstrations, means of assessment, and technologies relevant to the teaching of statistics, and it's also the most stimulating and thoughtful scholarly treatment of the teaching of statistics I have ever seen." "In Teaching Statistics, Hulsizer and Woolf provide a well organized and clear presentation of the important issues that face teachers at all levels, from basic to advanced. The coverage is complete and the material presented is based on the results of empirical studies as well as the authors own experiences. Especially for new teachers, the book will be an important tool to help them find their teacher's voice." 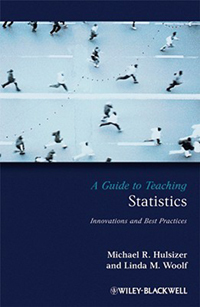 "Michael Hulsizer and Linda Woolf have put together a clearly written guide to teaching statistics that is based on a comprehensive review of literature in statistics education. Although the book is oriented toward teaching statistics in psychology departments, anyone who teaches statistics will benefit from this book, especially those new to the endeavor. The book is full of well-researched advice and guidance on teaching statistics that reflects current recommendations from the statistics education reform movement, as well as sound principles for instruction gleaned from the learning and cognition research literature. It will have a prominent place among my teaching resources."